Food bank registrations can be filled out online by clicking here. Hunger is a very real and widespread problem in many parts of the world. Even in our comparatively affluent Canadian society, many struggle daily to put food on the table for their children and others in their care, such as dependent elderly relatives. Those of us who are blessed with the means to meet our families' needs can make a great difference in the lives of the less-fortunate in our communities by helping provide them with adequate and healthy food. 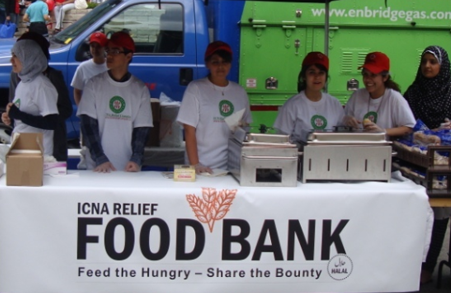 ICNA Relief Canada's Food Banks are a community-run project initiated in August, 2005. Thanks to generous donations, which are always welcome, it continues to serve the deserving and needy today. Our Food Banks target needy people within their specific regions. Due to unemployment or the inability to find jobs after immigrating to Canada, many people representing diverse ethnic, linguistic and cultural backgrounds turn to this service. Food banks are places of last resort for poverty-stricken people who cannot afford to feed themselves or their families. Anyone can find him or herself among the needy; hunger knows no boundaries. How does a family register? Applicants must register with the ICNA Relief Food Bank and meet our financial-need criteria. Due to limited resources, members may use the Food Bank only once per month. This allows us to give help to all impoverished families who are registered with this service. The ICNA Relief Food Banks are a community-supported project, completely dependent on donations of cash and non-perishable foods. With the support of local community groups, grocery stores, and caring individuals like you, we can organize food collection drives throughout the year to keep our Food Bank well-stocked and open to those in need. Does the Food Bank meet demands? Unfortunately, poverty is so deeply rooted in most Canadian cities, it requires constant support from caring members of society, like you, to alleviate it. In all the centres where they operate, ICNA Relief's Food Banks do their utmost to combat this problem, but they can only make a difference with your support. Making monetary donation (Online, Cheque or Cash): Commit to a one-time, or monthly purchase of a Food Basket that will provide the basics for a family. Providing non perishable food supplies: See food bank locations, above, for drop off sites. Helping in fund raising & giving time for food drives: Fill out the volunteer sign-up sheet to learn how you can be part of this effort! Motivating peer groups and families for donations: Use social media, word of mouth, and other means of communication to spread information about our outreach. All cash donations qualify for a tax credit receipt and you can be assured that we will put donated funds to immediate use in helping individuals and families who are unable to help themselves. 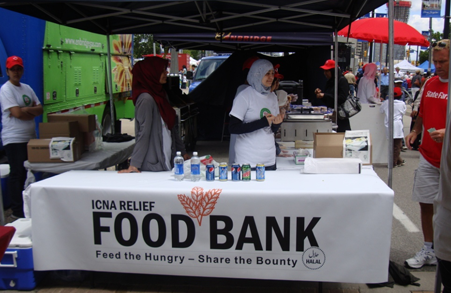 All donations to ICNA Relief Food Banks are used exclusively for providing food to needy and vulnerable members of our local communities. Contact one of the Food Bank locations above if you feel you may qualify for assistance, or help out by donating for one of our Food Banks! 34 - 174 COLONNADE ROAD.